For our youngest learners, there is an intentional decision to limit digital device use in the Beehive. Our focus is on developing the whole child including character, creativity, intellect, physical skills, and ability to contribute as a community member. The relationships and experiences that are needed to develop these areas cannot be replaced digitally or in a virtual environment. We do use digital technology to expand and document the students' experiences and thinking. Teachers use, present, and encourage discussion about digital content where developmentally appropriate. There will be many, many opportunities for your child to develop and engage in digital content and skills throughout his or her Catlin Gabel journey. Lower School students are gradually introduced to technology in age- and developmentally appropriate lesson plans. In 1st and 2nd grades, this primarily takes the form of student self-assessment as they demonstrate their knowledge and understanding of their own learning through the creation of videos and digital portfolios. Discussion of good digital citizenship principles including applying our own Lower School rules of "Be Safe and Be Kind" online are discussed and practiced frequently. In 3rd grade, in addition to self-assessments, students begin skill-based learning. This includes keyboarding with laptops using Typing Pal and increasing math automaticity using FasttMath. A set of iPads allows students to explore and record their learning both on campus and off. Students are also introduced to Google Apps for Education for writing and classroom projects. In the 4th grade, students receive their Catlin Gabel email account. They also begin to access the school's learning management system, Haiku, for daily coursework and homework assignments. Developing digital literacy and digital citizenship continues in full force as students begin to more deeply explore the online world. Skills continue to be reinforced with the use of Typing Pal, FasttMath and IXL in addition to Google Apps for Education. A set of laptops and iPads are available as needed and provide the opportunities for differentiation in instruction. By 5th grade, students are fully immersed in using technology for many aspects of their coursework. Laptops and iPads are available on an as-needed basis for blogging, research projects, writing and story creation projects, and curating portfolio content. Critical assessment and selection of digital resources and online content, along with appropriate copyright use, are emphasized. Students are not required to purchase a laptop in the Lower School. By the 3rd grade it may be necessary for a student to have access to a computer to reinforce keyboarding and math skills. In 4th and 5th grades, access to a computer for homework completion is required. If you feel the need to purchase a laptop for your child, we suggest a Dell Chromebook or Netbook. Please contact Daisy Steele if you would like assistance with laptop selection. The school does not purchase hardware for students. In the Middle School, emphasis is placed on guiding students through the intricacies of what it means to create a digital footprint. Digital citizenship and digital literacy skills are repeatedly practiced in a wide variety of environments. The Middle School Apple laptops and iPads, Chromebooks, and other mobile devices are available to students. Providing this assortment of hardware allows teachers and students to select the right tool based on the learning goals of the curriculum. Students are not required to have a laptop in the Middle School. Laptops and other mobile devices are provided for in-classroom and after school use. Students are required to have access to a computer to complete homework. This does not have to be a laptop. A desktop computer is perfectly fine. If you feel your child would work better with a laptop, we recommend the inexpensive Chromebook as an option. Please contact Daniel Flores if you have additional questions about laptop selection. Please contact Mary Yacob if providing your child access to a computer at home creates a financial hardship. All Upper School students are required to have a laptop. 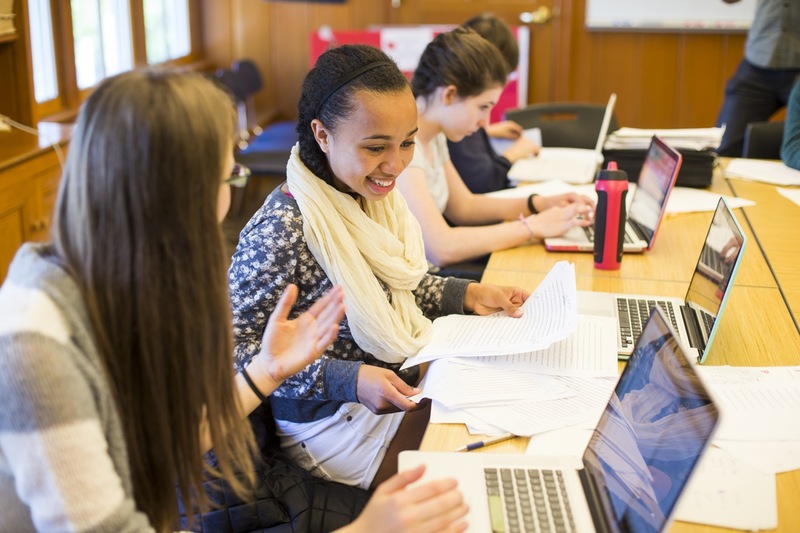 Laptops are used throughout the curriculum for research, writing, working on complex math problems, design, modern language acquisition, and collaboration in a wide variety of ways. The school's learning management system is called Haiku and provides students in 5th through 12th grades with online access to syllabi, coursework, a homework dropbox, and numerous academic resources. Students should plan on checking Haiku multiple times a day for academic updates. Laptops should be brought to school daily in good working order and fully charged. If your child is having hardware or software difficulties he or she should stop by the technology office in the Vollum building for technology support. Students are expected to check their school-provided email account regularly throughout the day for the most up-to-date information. Laptop models: The recommended models for the Upper School laptop program are either Apple or Microsoft Surface Laptops. Apple: We recommend MacBook Air or MacBook Pro Retina. We recommend no larger than a 13" model for weight and portability. Microsoft: We recommend the Microsoft Surface Laptop with 8 GB of RAM and a 256GB Solid State Drive. We are happy to assist you in selecting a laptop that will meet your child's needs. The school does not purchase hardware for students. Please contact Daniel Flores if you need assistance with laptop selection. Please contact Mary Yacob to inquire about laptop financial aid. As our children more time in the virtual world, it can be challenging to ensure that they are navigating safely. Below are some resources to help you have conversations with your child about digital safety and security. Many students bring at least one mobile device to school every day—most commonly a cell phone but also laptops and tablets. We encourage you to label all devices so they can be promptly returned to the owner. At a minimum use a sticker. Engraving is even more permanent. Laptops and cell phones might go missing if they are left unattended. Please do not leave your device alone and unattended for even a minute. Put it in a locker, keep it with you, or ask if you can put it in a locked classroom or closet. We strongly recommend that you activate the "Find My Phone" feature or install theft tracking software. Adding a password to the mobile device and enabling restrictions can help prevent loss of data should the device be lost or stolen. Additional information regarding security software can be found in the parent portal here.